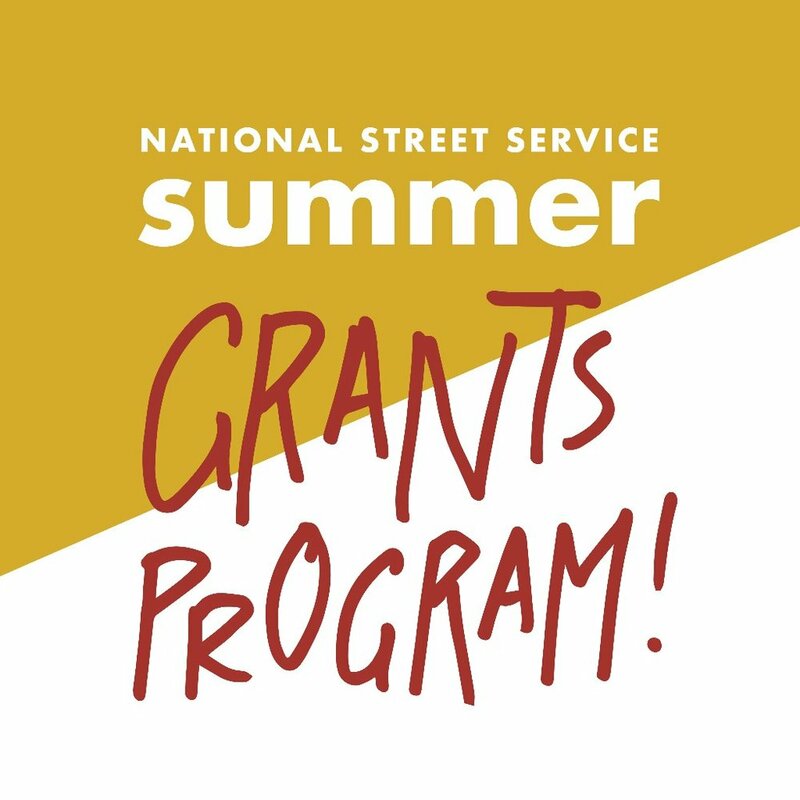 The National Street Service proudly congratulates the recipients of our Summer 2018 Grant Program. Our program is investing in five projects, led by passionate individuals and groups who want to build ‘street experiments’ that explore how to make local streets better on behalf of their communities. Check out their projects below! Project Idea: The goal is to foster more communication/discussion around neighborhood needs and wants versus what is readily accessible to community members. Brittany worked with a group of 6 high school youth in creating their own Dream Wall, a community Listening Box – hearing from the community what changes they were looking to see & participated in a Tri-city block party for a street appreciation day. With this grant, Brittany will work with the Youth Team to expand on this initial work & focus on awareness and recruitment of other youth of color. Project Idea: Vista Village and Collister shopping centers are mid-century suburban strip-malls now in urban neighborhoods. These malls have been the focus of the City and surrounding neighborhood and businesses for revitalization and activation, showing some success with becoming neighborhood 'places'. However both are located along very busy, people-unfriendly corridors - State Street and Vista Ave. - which are barriers to neighbors walking to these businesses. As old strip-malls, they do not front the street but sit back behind a parking lot making it less inviting. This project will bring these places to the street through pop-up parklets adjacent to these very car-centric, busy streets. Each place intends to attract all ages from the surrounding neighborhoods as well as others coming to the businesses and the business owners. Project Idea: The goal of this project is to transform a uninviting street in our neighborhood into a safe and community friendly space. Freemont Street connects a residential area with a commercial area. There used to be quite a bit of tension between the neighbors and the business owners in this location because of illegal dumping. 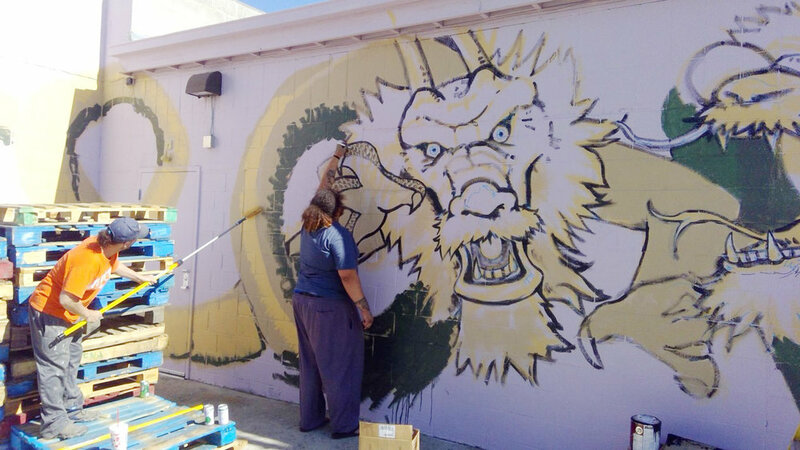 This project adds five large murals to Freemont Street. We aim to beautify the area, and thereby improve the usage pattern. Project Idea: The goal of the project is to tell the unique stories of how certain Baltimore Ave businesses got their start from humble beginnings by using historical marker signs, while creating a mechanism for those who live, play, shop on or near Baltimore Ave to provide feedback on the historical signs and also what “Street Pride” means to them. We're excited to see these great ideas make their way to the streets! We'll give a full update on the projects in October. People walk. And when we walk, we walk in rhythm with the world around us, adjusting in large and small ways with every step to avoid obstacles and encounter what we want - a nice flower, a captivating store display, a friend from down the street. While we walk we sometimes make the choice to cross the street even while we are not at a crosswalk. In the US, this normal, common, reasonable decision became disdainful and then became illegal. It became not just walking, but Jaywalking. As walking in cities resurges, we take a look at jaywalking and what a world of walking rights might look like. First, we must recognize that laws against jaywalking have been inequitably enforced. Not in distant history or isolated pockets, but right here and right now. As part of their Vision Zero pledge, San Francisco Police committed to issuing at least 50% of their citations for the five most dangerous driver behaviors(1). Since this program, known as Focus on the Five, was implemented in 2013 all of San Francisco’s police departments have increased the percentage of citations issued for these dangerous behaviours, but the increase is uneven. Only one police district (Richmond) is consistently achieving the goal of the program, and all SF police departments have bolstered their Focus on the Five (FOF) percentages by writing fewer citations overall. The city-wide FOF citation percentages have also been trending downward after peaking at 58% in September of 2016. Among these citywide statistics, the Tenderloin Police Department stands out for consistently missing the mark, and perhaps the whole point of the Focus on the Five program. Every street in the Tenderloin is on San Francisco’s High Injury Network list, the 12% of SF’s streets that account for over 70% of all severe injuries and fatalities for all road users. This makes it especially alarming that the Tenderloin has the lowest rates of FOF citations in the city. 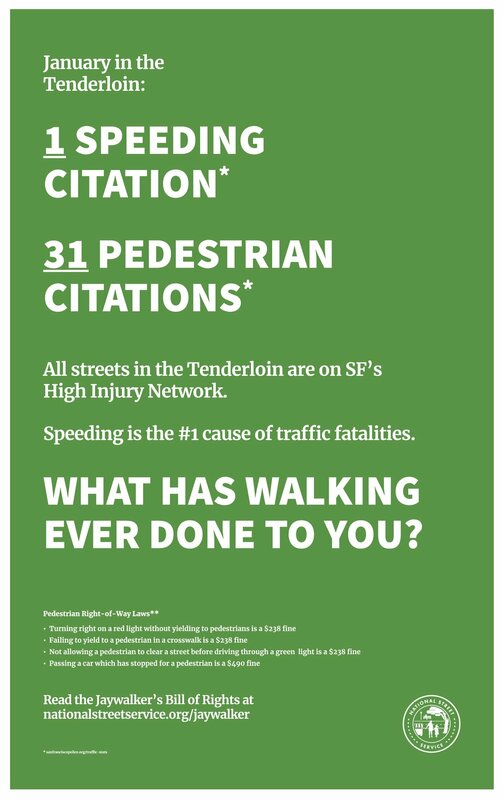 Even worse, the Tenderloin Police Department has a very high rate of citations for pedestrians and bicyclists, often citing as many or more people walking in the Tenderloin as all other police districts in the city combined. This might be because of higher rates of pedestrian violations. It may also be because of biased policing practices. 2017 High Injury Network map from Vision Zero, with Tenderloin Police District boundary added. About 70% of workers living in the Tenderloin do not have access to a car(2), so this policing disparity means that people in the Tenderloin are much more likely to be seriously injured in traffic and much more likely to be targeted by law enforcement for walking than people in other parts of San Francisco. Because of the low car ownership in the Tenderloin, we know that unsafe motorist behavior comes from drivers from elsewhere and impacts -literally- Tenderloin residents. The Tenderloin is home to the most children per capita of any neighborhood in San Francisco, and the highest concentration of social services. It is a critical neighborhood to defend against traffic violence as well as other forms of violence. In San Francisco we value fair enforcement of fair laws. In committing to Vision Zero, we have acknowledged that the streets are not safe, and that they could be safer. We recognize that dangerous driving is at the root of traffic injuries and fatalities, and that increased enforcement might deter the most dangerous driving behavior. Other parts of the city are succeeding at this, so it’s fair to expect that the TLPD can succeed here too. The Richmond Police District, the district with the most consistent success at Focusing on the Five, issued an average of 142 speeding citations each month in the first half of 2018, and an average of about 1 citation each month for pedestrian and bike offenses. In the Tenderloin, police wrote an average of 11 speeding citations each month in the same time, and an average of 27 citations each month for pedestrian and biking offenses. In neither district was every speeder or jaywalker caught- enforcement is not as potent as design- but penalties accrued to those acting most dangerously in the Richmond, and to those who are most vulnerable in the Tenderloin. Right now in the Tenderloin, laws against jaywalking are enforced more often than laws against dangerous driving, even though the the city’s policy is to focus on the most dangerous driving behaviors. Every day, TLPD go onto the streets and make complex decisions. Every day, they have the opportunity to improve these statistics, to enforce laws against dangerous driving behavior as laid out in the city-wide Focus on the Five program. Over the last year SFPD has failed to make their FOF enforcement goals, decreasing the rates of ticketing overall, and decreasing the rates of ticketing for the most dangerous behaviors even more. While other police departments are going low, TLPD can go high by prioritizing enforcement against the actions that make their streets so dangerous for people walking. Furthermore, their own data show that the Tenderloin police can switch to FOF enforcement. In March the TLPD wrote ten times more tickets for blocking the pedestrian right of way than their average for the twelve months surrounding March. We know there is a pervasive attitude of victim-blaming for traffic injuries. Messages for pedestrians to look up from their phones and be more careful crossing the street proliferate and even become laws in some places. 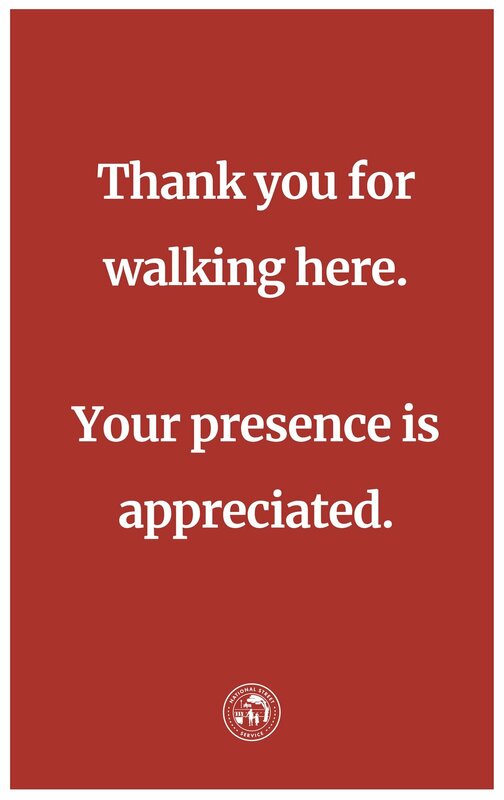 These messages miss something fundamental about walking: it’s the only free way to see the world and get places. If we enforce laws against walking more than we enforce laws against speeding we have expressed something backwards about danger and responsibility. In the Tenderloin and many other low-income, center city African-American neighborhoods, this enforcement also speaks to a tacit priority to police black bodies as matter out of place. Just as jaywalking has come to be disproportionately enforced against black people(3) we can expect that the laws against “distracted walking” would not be equitably enforced. No matter their origin story, these laws are not about public safety. Laws that criminalize walking are about enforcing the placement of people in the social order as much as in the streets. I started researching the policing of jaywalking because of my interest in streets as a public place. Through the National Street Service, a project from Ford’s Greenfield Labs in partnership with Gehl, I worked in our Local “R+D” Lab to come up with a way to bring the facts about jaywalking into conversations in the Tenderloin, a disenfranchised neighborhood with a bustling street life. The Local Lab is a project to come up with quick ways to get big ideas into the streets and incubate future National Street Service programs. Through observing public life in the Tenderloin and using publicly available data from the SF Police Department and the US Census Bureau, I found a set of conditions worth talking about. I observed a full public life that is poorly supported by the infrastructure, laws, and customs of San Francisco. For example, many residents in the Tenderloin ran into each other and stopped to chat outside the convenience stores, bottles of soda and bags of snacks in hand. In a different neighborhood they could sit at sidewalk cafe tables to enjoy their drinks and snacks, but convenience stores don’t get those kinds of amenities. In fact, few streets in the Tenderloin gets these kinds of amenities. The amazing thing about the Tenderloin is how many people spend their life out on the streets there despite the unrelenting inadequacy of the facilities. People are constantly meeting and chatting, standing around for half an hour or more at a time. Although some street infrastructure is sorely lacking, one thing was ubiquitous: the advertising poster frames outside the convenience stores. They are everywhere in the Tenderloin and neighborhoods like it in the US. This poster message is seen often throughout the Tenderloin, and in many other central neighborhoods in the US. It turns out this message is just the generic backing board for the poster frame. Because I saw so much public life happening right in front of these empty poster frames, I thought they would make a good asset for information in the Tenderloin. Back in the office, the NSS Local Lab team quickly put together a set of posters based on the facts about policing and walking in the Tenderloin, and proposing rights for walkers. Then we tried them out in the street. For future postings we think it would be good to partner with the convenience stores to put up the posters permanently. These were printed on thin drafting paper and would not stay up on their own in the gusty Tenderloin streets. But even though they were only up for about half an hour, we still got some conversations with Tenderloin residents and workers about the street and the right to walk. One passerby we talked to reflected, “Even if it is illegal to jaywalk, people don’t deserve to be hurt because they do it.” Our posters emphasize an expansive, generous view of pedestrian street life in contrast to current legal pedestrian rights, which can be most succinctly summed up as the right to keep moving. 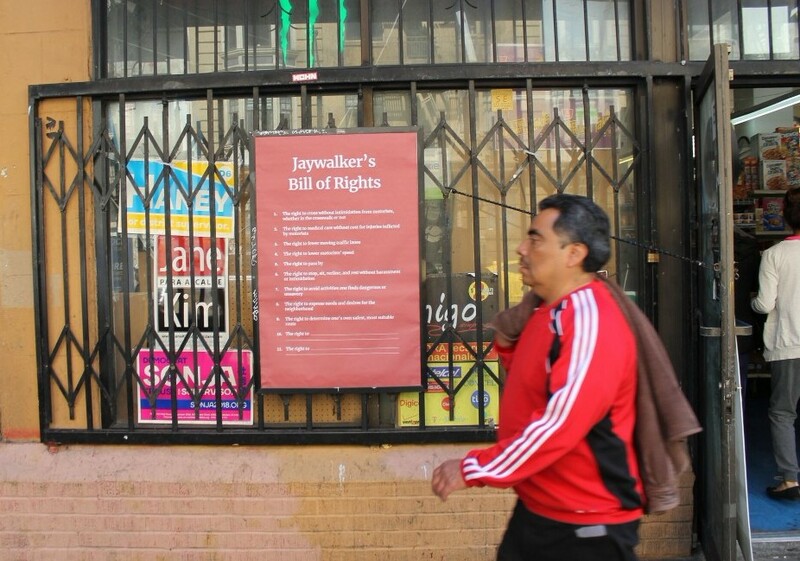 Two Jaywalker Bill of Rights posters on the front of a convenience store in the Tenderloin, San Francisco. Tenderloin residents generally have low access to jobs and parks, and have small apartments. Because of these factors they use streets differently than people in other neighborhoods; selling small goods (what might be a yard sale or garage sale in another neighborhood is a sidewalk sale in the TL- residents there don’t have yards and garages), arguing with friends and lovers, relaxing and hanging out with other people. These normal actions become legally deviant when they happen in the street, even if they don’t pose harm, because of inequitable ideas about what and who the street is for, and inequitable design and social support for a variety of life(4). 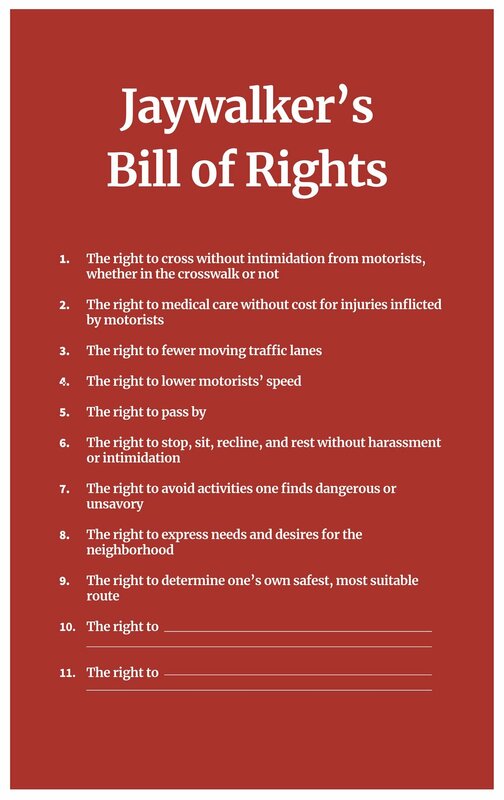 Pedestrian and bicyclist traffic citations are possible anywhere in the city, but come down hardest on people with the fewest resources, especially people of color, who face more barriers in the justice system. High rates of pedestrian ticketing in the Tenderloin disproportionately polices the people of color (POC) who live there, and the POC who receive these citations have fewer resources to deal with them. They are doubly overburdened by this system. In the Tenderloin, racism, policing, and poverty intersect, and they often intersect in the intersections. We know that people jaywalk all over the city, including other neighborhoods with high rates of poverty, low rates of car-ownership, and small apartments, such as Chinatown. The policing disparity exists within the Tenderloin Police District and not within the Central Police District (which contains Chinatown), suggesting that it is not simply high density, high rates of infraction, or high rates of poverty that explain the discrepancy. The Central Police District also falls short of the FOF pledge, but does not cite as many people walking or biking as the Tenderloin PD. The Central District shares some features with the Tenderloin: it has a high-density, high-poverty core and a robust street life. One major difference is that the Tenderloin has a large African American population, while the Central District has predominantly Asian American and European American residents. The Tenderloin Police District and the Central Police District are right next to each other, but exist on different sides of America’s racialized policing dynamic. The enforcement component of Vision Zero is meant to support equity by holding police to a city-wide standard about which traffic laws take priority. Police are supposed to be protecting people by deterring the root cause of traffic injuries: dangerous driving. What we see in the Tenderloin is a persistence of enforcement against people instead of against danger. The most dangerous driving behavior is allowed, and walking is punished. I want to see the Tenderloin Police Department use their capacity to enforce laws in service of protecting the local residents consistently and fairly. This means they should write more citations for FOF offenses, and they should write fewer citations for pedestrian and bicyclists. It would also be helpful for them to give more visible support for street design projects that make walking, biking, and driving safer in the Tenderloin, which might decrease the need for enforcement overall. Ultimately, laws prohibiting jaywalking and other normal pedestrian behaviors, like stopping and sitting, ought to be repealed. They do not serve our needs for making city life better, and they make city life much worse for those unjustly targeted for enforcement. Walking should be as much a right as living. Walking is an essential and unavoidable way to be a human in public. Right now, policing is still mired in laws and enforcement that allows bias into their work. Vision Zero can help police officers focus on dangerous behavior instead of policing people for walking and biking infractions. By focusing on dangerous behavior, officers can minimize racial bias in their policing and become better, more trustworthy agents for the safety of their neighborhoods. By demonstrating a willingness to enforce laws against dangerous actions that put Tenderloin residents at risk of serious injury and not overly-enforcing laws against walking, police can help to strengthen and repair their relationships with people in their districts, especially low-income people of color. Vision Zero is the pledge many cities have made to ending traffic fatalities and major injuries. The top five most dangerous driver behaviors identified by Vision Zero are: speeding, running a red light, running a stop sign, failure to yield while turning, and blocking the pedestrian right-of-way. From ACS five-year data for “Journey to work” responses in Tenderloin Census Tracts. Modes available to non-workers are not recorded, but are unlikely to include a private car due to cost constraints. This is not meant to minimize the serious criminal activity that occurs in the Tenderloin, which includes an outsized portion of the city’s arrests for drugs, weapons, and violent crimes. This is simply meant to suggest that not all activity that is deemed illegal is bad or dangerous. Much of the same kinds of public life are given social support and permission in other neighborhoods. Since this brief essay focuses on traffic citations and public life, discussions of policing violent criminal activity have been left out. At first, it may seem surprising to learn that the National Street Service was born from Greenfield Labs, a team within Ford Motor Company. After all, Ford owes much of its success to America’s highways, not its streets. But as new technologies — from autonomous vehicles to smartphones — are disrupting transportation, and as awareness grows of the costly impacts of neglecting our streets and street life, Ford is transforming too. Greenfield Labs is a human-centered design group, created to place human needs back at the center of everything we do. One of our major new initiatives is the National Street Service, inspired by the custodial mission of the National Park Service. Over the past year, Greenfield Labs has been dedicated to humanizing our relationship with streets. America’s streets are where life happens. They are our economic engines and destinations for social activity, while still channels for everything that moves. As we have shared, at Greenfield Labs we have a passion for preserving and enhancing the life, economy, and mobility of the American street. 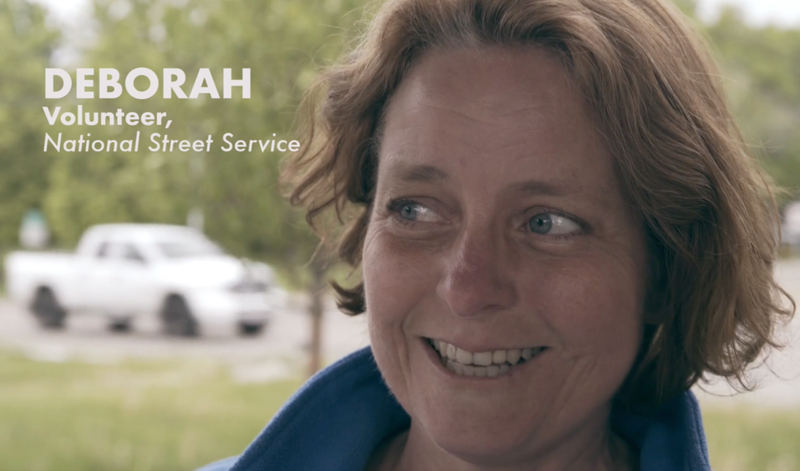 In search of a meaningful way to foster conversations about the potential of America’s streets, Greenfield Labs, in collaboration with globally renowned urban design firm Gehl, created the National Street Service. It is a participatory social movement with a simple message — that the street is yours; yours to use in ways that are meaningful to you, and yours to change to better reflect the values of your community. We want streets that provide places of personal fulfillment and give access to opportunity for all people in cities. The National Street Service was born not just from our own recognition of the needs in our streets, but on top of the long history of a company inextricably linked to these streets. Here we want to share this history in greater depth and how it has brought us to this place. To understand the full story of the National Street Service, it helps to go back to beginnings: to the beginning of Ford Motor Company, and the beginning of its relationship with the cities of America. At the dawn of the 20th century, streets were for people. They were multimodal and teeming with activity, which catered to a variety of human needs — including, but not limited to, mobility. In that era, the Ford Model T was ramping up production, paving the way for a revolution that democratized access to transportation by creating a personal vehicle affordable to the everyday American. The promise of this new technology was reflected on Ford’s now iconic advertisement in 1925, announcing to all that they intended on opening the highways to all mankind via their growing stable of automobiles. The advertisement maintains the human experience as the focus in the foreground, but hints at the shifting landscape to come as highways blanket the landscape in the distance. By the time of the 1939 World’s Fair in New York City, Ford’s vision had grown more machine-oriented. And the streets of our country reflected this. The nation’s focus became highway building, as opposed to street development. Streets that had been multimodal places centered on the needs of people, became dominated by cars. Old rules and norms that allowed children to play in the streets or people to cross the street anywhere fell to new restrictions and cultures that kept children on the sidewalk and punished people for not using crosswalks. The city street as our great-grandparents knew it was gone. Now, new technology has entered into the realm of transportation and our streets, disrupting them on a scale not seen since the advent of the car in Henry Ford’s day. The arrival of smartphones, and the coming tide of autonomous vehicles proposes a radically different future; in which car companies seek to offer mobility — the ability to move through cities to conduct the business of life — as a product; rather than the vehicle itself. Greenfield Labs exists to help people rethink and rediscover their streets. But how can we recover this vision for streets? It was this notion of returning to solutions with people at the center that led Jim Hackett to create Ford’s Greenfield Labs in 2016. Our lab is responsible for using human-centered design thinking to inform Ford’s future growth. Jim describes the lab as “a place where we can learn and innovate by putting the human first — and it represents the opportunity for Ford to continue its place at the center for another century of mobility leadership.” Recognizing the societal and industrial shift underway, Ford’s aim is to grow from being just a car company to a broad-ranging transportation company; one that provides access — for all — to mobility. And not just any mobility, but mobility that is also exceedingly safe, meets people’s needs in affordable and equitable ways, and ensures we all benefit from livable streets. Volunteers get down after a successful share-back in Boise! A big thank you to everyone who came to our sharebacks last week in Boise and Philly! We had a blast hearing from our amazing volunteers about what they learned and accomplished, had great conversations about what the National Street Service can do next to focus the conversation about streets on people, and celebrated what we’ve built together! One of the things we've heard loud and clear is that people want the NSS to connect more with local policy and design initiatives. Please don't hesitate to reach out to us with any questions or ideas for how the Street Service can dovetail with work happening in your cities. Check out our Instagram for highlights! The National Street Service is going on summer break next month while we process what we’ve learned and make a plan for what’s next. But, before we do we wanted to leave a few things behind. See below for exciting ways to stay connected to the National Street Service and keep momentum going through the summer. We are thrilled to offer ten grants of between $5 and $500 in support of National Street Service participants who want to build ‘street experiments’ exploring how to make streets better places for people. These grants are an opportunity to iterate your street experiment, host community conversations, or explore an idea that came up while observing and reflecting on your street. To be eligible, complete our Soul Searching training and fill out an application form by Monday July 9. Experiments must be completed by October 1. Find out more and apply at nationalstreetservice.org/2018-summer-grants . Questions? Send them to HQ@nationalstreetservice.org by July 3. All questions and answers will be posted on the grants webpage above on July 5. We are proud to offer our complete Soul Searching training kit, which is a crash course in street transformation. The course covers our process step-by-step, from observing and reflecting on your street through to creating a small ‘street experiment’ to test your ideas to improve your local streets. The entire kit can be downloaded from our website - visit nationalstreetservice.org/tools to get started. Next month before we go on summer break we’ll be sharing news on what’s next for the NSS as well as note from our City Leads. See you in July! National Street Service Volunteers will host three simultaneous block parties on Sunday, May 20th from 2:00 - 6:00pm. All three parties are free and open to the public, and will offer food, drinks, prizes, and family friendly activities. PHILADELPHIA, Penn., May. 14, 2018 – Volunteers from the National Street Service will host three simultaneous block parties in Philadelphia on Sunday, May 20th from 2:00-6:00 pm featuring food, drinks, prizes and family friendly activities. The event is being organized by the National Street Service, an organization which mobilizes everyday people to observe, reflect on, and care for the streets that matter to them and their communities. At the Tri-Block Party, volunteers will share what they have learned to build support for better use of street space in Philadelphia. The event will take place across three sites - South Philadelphia at 22nd and Carpenter near bus route 7, West Philadelphia at 47th and Hazel Ave near the 34 trolley line, and North Philadelphia at 11th and Huntington Street near North Philadelphia Station - BSL. The block parties will be hosted by the 25 Philadelphians who have just completed their National Street Service volunteer training. The training program is designed to help them closely observe their streets, in order to reflect on what is working well and where there are opportunities for improvement. The event is an opportunity to share what they have learned, and spark people’s curiosity about how streets can better serve all who share them. 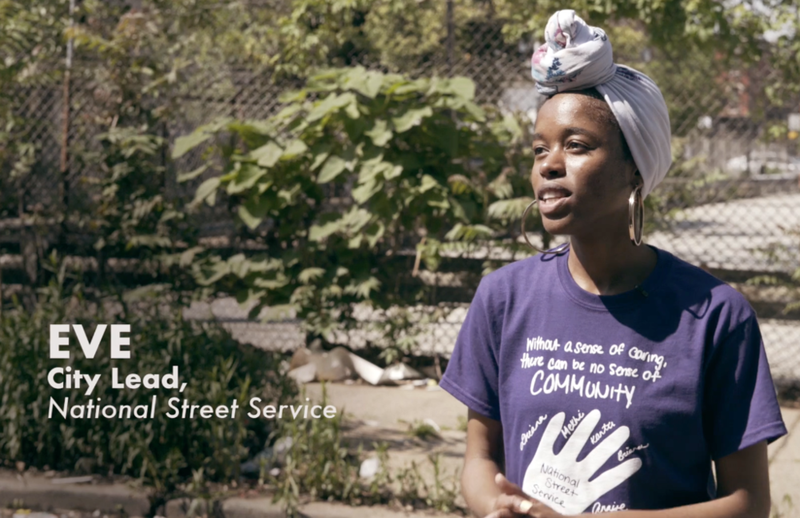 The National Street Service works across neighborhoods, generations, cultures, and city lines to celebrate the people, places, and moments that make our streets so valuable. We honor the soul of our cities by working with everyday people to make streets better places for everyone. National Street Service Volunteers will host Boise’s Public Lands Tour on Saturday, May 12th from 1:00 pm to 5:00pm. BOISE, Idaho, May. 7, 2018 – Volunteers from the National Street Service will host The Boise Public Lands tour, a free event which celebrates the streets of Boise on Saturday, May 12th from 1:00 pm to 5:00 pm. The event will feature snacks, drinks, ice-cream and family-friendly activities. "Our streets are also public lands," said Casey McLellan, a City Lead for the National Street service, who is leading volunteers for the event. 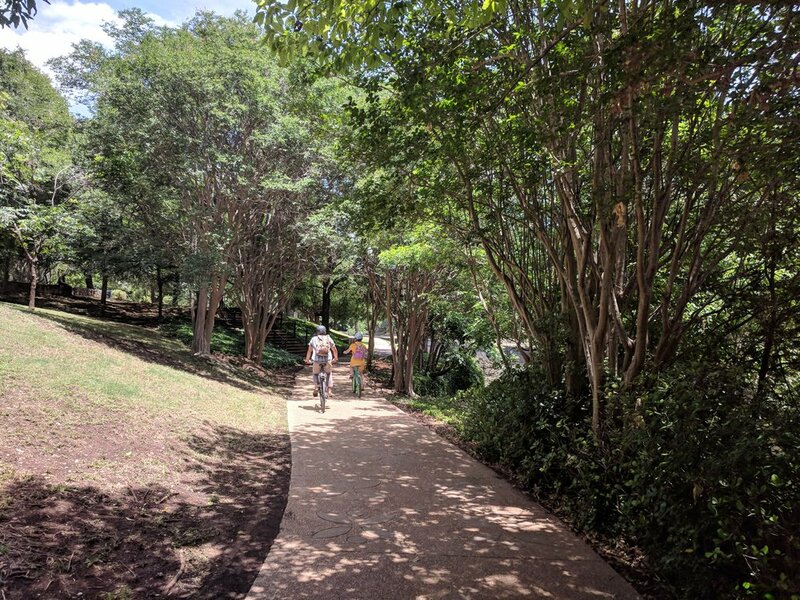 "We thought it made sense to borrow from the language of natural areas to bring home the fact that these streets belong to people, and to invite everyone to share what they want from these valuable resources." At Vista & Targee in the El Ada Community Action Parking lot will be the starting point for a guided walking tour and an interactive photo wall, which offer visitors a chance to reflect on the value and potential of Boise’s streets. 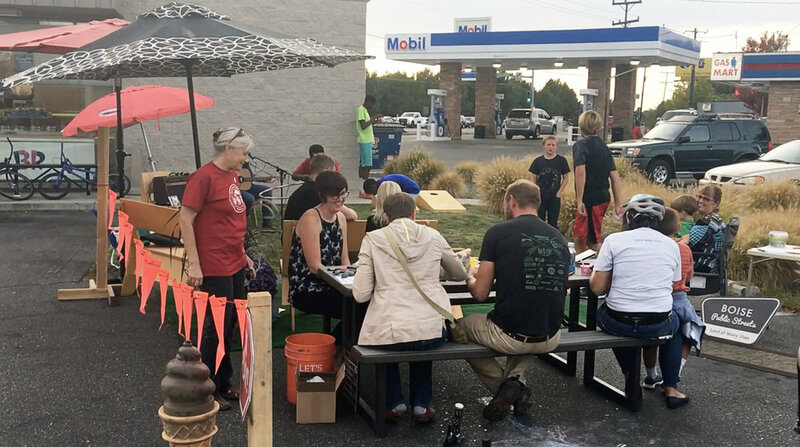 At Orchard and Denton, volunteers will transform Thriftology’s parking lot into a comfortable and protected place for people to interact and engage complete with games and music. On Broad Street between 5th and 6th Street, there will be dancers, games, and activities to explore what permission and ownership of the streets can mean to the community. The three sites will be linked by a free trolley, which will run every half hour between the locations. The first trolley will depart from the corner of Vista Ave and Targee St at 1:30 p.m. Visitors who make it to all three stops will be offered a prize. We are now 7 weeks into our 10 week pilot of the NSS in Philadelphia and Boise. Over 50 volunteers have now completed the NSS Street Soul Searching Curriculum and implemented their own experiment ideas on their streets to test ways to make the street a more inviting place for everyone. During the next few weeks everyone will be working on phase three: The Street is Ours! project, collectively working as a team to implement a final project that will showcase what the NSS can look like in each City. Stay tuned. The Boise Public Lands Tour is a celebration of streets as places for people in Boise. Open to the public! Saturday, May 12th - location and times to be announced - stay tuned! A showcase and celebration of the work that our National Street Service Volunteers completed in Boise. Tuesday, 19th of June - 5:00 to 8:00pm - location to be announced - stay tuned! Please join us in simultaneous street celebration at one of our three street parties taking place in Philadelphia. Open to the public! A showcase and celebration of the work that our National Street Service Volunteers completed in Philadelphia. Thursday, 21st of June - 5:00 to 8:00pm - Center / Architecture + Design 1218 Arch Street Philadelphia PA 19107. The simple act of entering the street for the sole intention of engaging with the street for soul searching activities allowed new layers of information and beauty to reveal themselves. Some of the stories I heard included people noticing a mural that they had walked past but never noticed before; sparkly tile mosaics embedded in a patch of sidewalk; a change of sidewalk texture that made it more difficult to push a cart across; and an array of discovered green patches and local treasures. To share their experiences with others, people began to post signs that said, “Eyes up, phones down”, “Take a deep breath”, and “This is a great place to meet a neighbor” – all in an attempt to share with their neighbors their newly discovered sense of place and ownership of the streets. Of course, there were observations of less desirable things as well. People noted trash, illegal parking on sidewalks, lack of places to sit, lack of shade and greenery, and streets that were loud, windy and unpleasant to walk down on an early-spring day in Philadelphia. People grappled with ideas for ways to improve some of these less comfortable streets, focusing on ways to highlight positive aspects despite the shortcomings of the surroundings. Overall the passion that the volunteers brought to the soul searching was inspiring. One told me that she had met more neighbors in the last week then she had in the 2 years she had been living there. Another told me that he would never walk past a bike rack or street tree or sign post and think about it in the same way again. It shows me that even with these small moves and observations we can start to change the way that people appreciate and interact with the spaces that they use every day. Our truly public spaces – the streets. Kellie and Hannah’s Chalk Corner. They gave every person on the block a piece of chalk and asked them to draw what they loved and/or wanted to see added to the street. The Kick-off Summit was our first opportunity to get everyone together and celebrate what was learned so far throughout the program. The night was full of great conversation, questions, and excitement. The goal for the event was to brainstorm projects unique to each volunteer’s experience. For some, ideas came quickly, for others, a more methodical process. Fortunately, the benefit of working in a large group is positive words and encouragement are readily available. 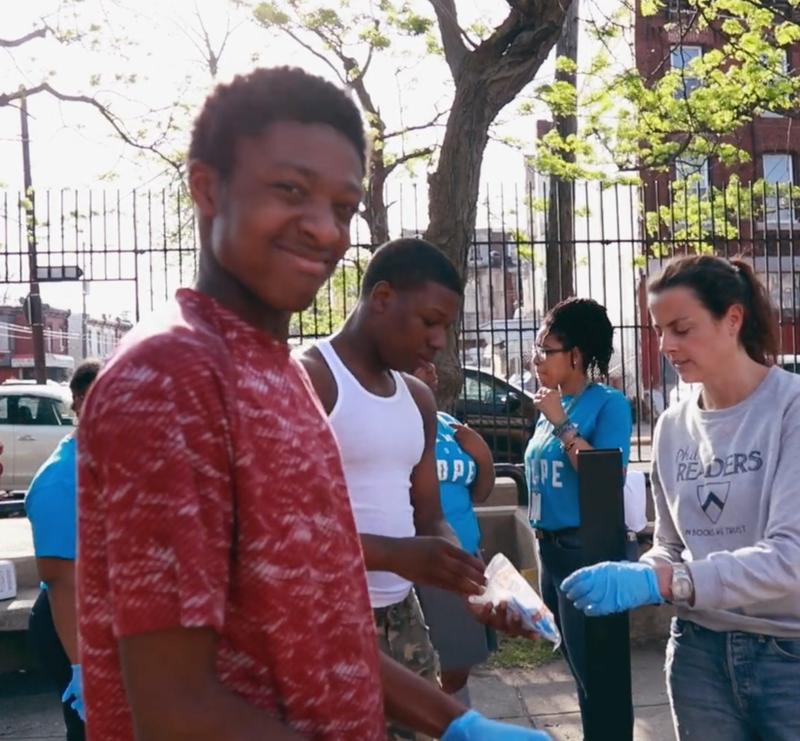 With the Soul-Searching phase of the program behind us, volunteers now had the opportunity to go out and share their own values of the street with others. Question was, what exactly would this look like? The small experiment and project phase was a new concept for everyone. How often do we do random projects in our street? For most, never. Is it even allowed? This idea of tactical urbanism was an intimidating one. As the ideas slowly trickled in and things started to take shape, you could feel the nervous excitement building. The next step – put the idea into action! It is amazing to see the creativity and ideas the volunteers bring to the table. Each project was entirely different. Some examples were a non-traditional way-finding project encouraging people to highlight a communal map with hidden gems and pathways throughout their streets; an interactive sidewalk with fun, games, and art to engage kids and families while walking through their neighborhood; and a feedback board placed near the downtown transit center inviting people to rate their overall experience during their morning commute. The experiential learning process of this phase was an important one. Even with these great ideas, many expressed an initial hesitation when carrying out the actual implementation of their projects. The question of permission was a recurring theme. People expressed a similar wave of emotions with each of their projects. There was an initial hesitation to start and uncertainty of what others would think. All of this started to dissipate as they embraced the process. Some projects were left out throughout the day while others were more person-to-person focused. People were encouraged by the positive feedback and the impact their projects generally had, with many expressing a desire to do more. By going out into their streets and doing these projects, people felt a sense of ownership and voice. This is something we plan to carry into the next phase of our program – a large project in the community sharing all that we’ve learned. We are excited to get back to the brainstorming process and find a way to communicate our shared values of the street with others. Introducing Our Boise and Philly City Leads! City Leads are out and about, working with teams of volunteers in their cities. Thank you participants, neighbors, passersby and onlookers! We just wrapped up a fantastic inaugural month of activities where we explored how to build empathy on our streets, expose and start conversations around shared values, and get people involved in re-making streets for the better. 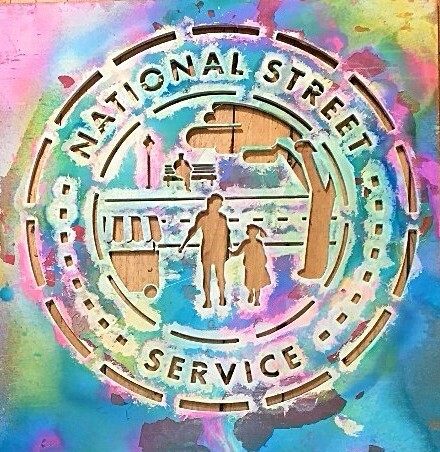 The National Street Services believe that our needs and history are reflected in the street. Our streets are fundamentally connected to our sense of self. Unfortunately, not everyone experiences the street equally. In fact, the layout of many streets is hard-wired to support some people and modes over others. So we created a program that sought to awaken people who the street privileges, to the fact that that their needs are often met at the expense of others with less privilege, or to the detriment of our shared values for safe, livable, enjoyable places to be. Our streets should be constantly changing places: the ability to adapt, accommodate, get reused and meet new needs as well as old ones, keeps a street valuable and useful. Great streets are forever being perfected. But what if you live on a street that’s changing, and you don’t feel good about that change? Or perhaps you desperately want to see change and it’s just not happening. How do we keep streets vibrant places that meet our needs today, while respecting our heritage and history and what made our streets great to begin with? How many different ways can we value our city streets? There are things that immediately jump to mind, like the investment in a roadway, or the revenue the city receives from parking meters. And then there are more intangible values, like what a street tree contributes to the cleanliness of the air and water in the city, or what a bench gives to every individual who rests there. “I have power over the changes on my street.” Would you agree or disagree? 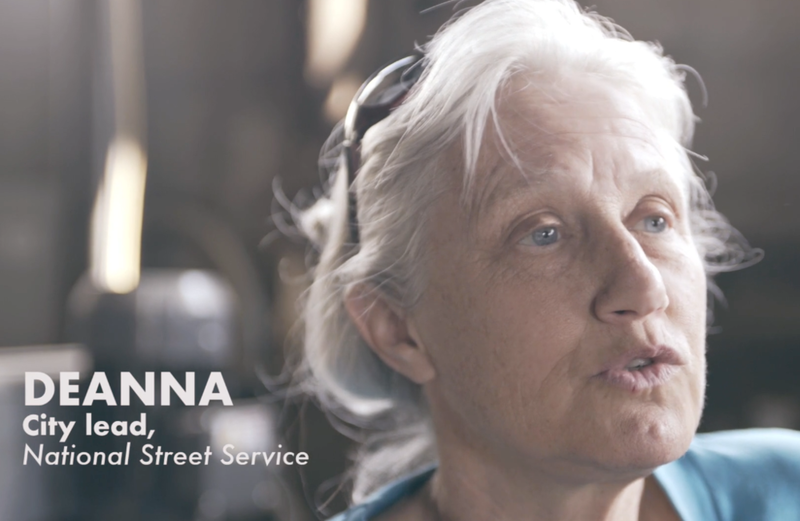 We at the National Street Service believe that the best way to be open to change is to get involved in it, and the best way to see change is to take the first step. The street is public space, and we as a community should have a strong voice in deciding how to best use it. But how can we engage everyone in the community in this process? Through our Street Ranger program, we worked with 20 Street Rangers to help them feel a part of the change in their street and feel more confidence in their ability to make changes in future. Our Street Rangers successfully completed a wide range of activities, demonstrating considerable talent and enthusiasm for street advocacy (thanks everyone!). Street Rangers launched 14 conversations with city government officials around requests for physical street infrastructure. Street Rangers added 10 chalk outlines to the street as a bold statement on where benches for rest and reflection should be installed. Street Rangers worked with the Public Bench project to install 5 uniquely painted public benches. In fact, one is on the ground already! Our Rangers also reported a significant increase in the power they felt they had to make changes in the street, all through taking small but important actions to improve on an issue of importance to them. Our Street Ranger program was a broad success, validating our hunch that we can see a great deal of positive change by activating the people in every community who care deeply, but perhaps haven’t found the right opportunity to get involved. Stay tuned for what’s coming next for the National Street Service’s Street Ranger program (and let us know if you want to be involved, joinus@streetranger.org). In the meantime, read on to hear more about how our week of participation went. Who are these fabulous people who made so much change, and indeed saw change themselves, in just one week? And what did we ask them to do? Let’s learn more through the story of Street Ranger Em Havens, who generously agreed to let us share some details of what she got up to during her Street Ranger week. Our first task for Em, and indeed all our Street Rangers, was the simple task of street observation. Setting a timer for 10 minutes, Em noticed that the street serves medical staff and passersby heading to and from nearby USCF, as well as neighbors headed in and out of their homes. Drawing on her personal history in Portland, Oregon, Em remarked that she missed the porch culture she experienced there, a culture where people stop and chat and engage with their neighbors. Yet, she also noticed that when people do run into each other on her chosen street in San Francisco, they are always friendly. Taking the leap to action, Em identified this as an opportunity to build upon this sentiment and provide more infrastructure to allow people to more casually collide and connect. Providing people with rest and reflection. We offered three options for street enhancement that the Rangers could choose from. Em decided she wanted to add spaces for rest and reflection, building on her own personal theory of change about the importance of providing spaces to better “collide and connect”. Like all our Rangers, she then got started on the 5 action items we provided - each of which had been carefully tailored for that topic area. Observation is an important valuable activity but it’s also fairly passive, and our Street Ranger program was ultimately about taking action. But taking action for better streets can be daunting. How do you take the first step? To that end, one of the most powerful tools in our Street Ranger advocacy kit was a humble stick of chalk. As Em discovered, chalk was transformative both for those drawing with it, and for those passing by and witnessing our Rangers’ creations. The chalk provided a means to physically interact with the environment while leaving a mark (in a low risk way), helping both the creator and the passerby translate the idea of new infrastructure into a more relatable and more tangible visual. Chalking the street was definitely an easy first step, but it also happened to be fun. Streets are serious business, but like anything that’s human-centered, need a healthy dose of fun from time to time. We try and ensure the National Street Service embodies this principle, from the focus on street chalk to the design of everything we produce. Whatever they thought of the hidden powers of chalk, many of our street rangers, including Em, made amazing use of it. Some of our rangers went beyond the physical, employing “digital chalk” to create renderings of their vision for the street. We aren’t fussy: any creative, non-destructive (and respectful!) means of expressing your vision for a better street, is fine with us. Chalk is powerful, but when it comes to changing the street for the better, rarely enough. The next step for our Rangers was, in many cases, to reach out to other organizations and authorities to put their personal visions for change into action. In Em’s case, we recommended she contact Chris Duderstadt of the Public Bench Project, who has installed over 75 benches in San Francisco. Em reached out, and Chris generously provided guidelines for how to get a public bench added to her street. He even designed a rendering, worked with Em to get the color just right, and then installed it, all while recovering from back surgery (thanks Chris!). While we wanted our Rangers to feel empowered, putting something physical into the street isn’t always easy: it requires navigating often hidden rules for what can be placed and where, and negotiating with neighbors and business owners for their tacit approval. Em did a fantastic job of following her intuition and Chris’ direction to get appropriate “social license” for her bench. It took Em vision, thought, chalk, e-mails and conversations, plus some periwinkle paint to get done, but get it done she did. A beautiful bench now stands near UCSF, hopefully providing rest and reflection to passersby and neighbors for many years to come. Em demonstrated beautifully how a modicum of effort, time and partnership with other members of the community can deliver a better street (even in a physically small way). Thank you for your service, Em! Physical installations like benches are a great way to dip your toes into advocacy for better streets. But like it or not, much of the responsibility (and power) to change streets lies with our politicians and city agencies. Getting involved with political debates and participating in public process can be daunting, so we looked for easy ways to get our Street Rangers engaged. Em, for example, also emailed her supervisor London Breed, urging her to support street designs that are more human focused and provide people with opportunities to socialize. 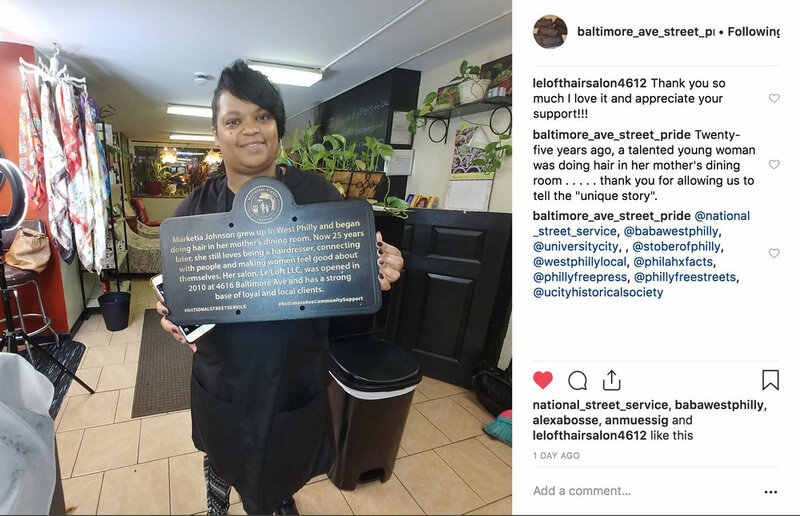 We at the National Street Service believe that such requests can be powerful, especially when paired with photos and anecdotes from the observations. They go above and beyond a mass e-mail or petition, because they demonstrate the obvious commitment of the person making the request. Perhaps more importantly, these relatively quick and easy ways of engaging with broader debate around better streets can be especially empowering for the individual. Our Street Rangers took surveys before they got started, and once again at the end, so we could measure how their attitudes and feelings had changed. In particular, we asked how people felt about their sense of power over the changes on their street. Many of our Rangers really did start a conversation. They were pleasantly surprised that when they wrote to the city, they got a quick response often full of detail and support. They felt an awareness that someone was listening to their concerns, which can be a real hurdle to participating in broader change especially around big challenging issues. But some of our Rangers never got an answer. For them, this project revealed inadequacies in the system: how our streets are designed, how they’re managed, and the public engagement process for ensuring that everyone can have a say. One street ranger said, “No one is responsible!” as they struggled with getting traction on their chosen issue. Others felt that the tools we provided them just weren’t enough given the scale of the problem and the effort needed to resolve them. Many Rangers felt they could have done with even more support, something we recognize and will be considering as we move forward. While the challenges are significant and it is easy to feel disheartened at setbacks, many of the street rangers noted that they felt “activated” and wanted to do something bigger. Particularly in the context of there being few opportunities for change at a national level, this kind of hyper-local action felt especially tangible and important. We think there is plenty of evidence here that taking a small but personally involved step towards change can encourage people to feel fundamentally more comfortable with change. Our Street Ranger one-week program may be, for some, the first rung on the ladder of participation. We sincerely hope all our Street Rangers don’t stop here, and continue to intervene and advocate for safer, more livable and more human-centered streets in San Francisco and beyond. Our Street Ranger program was a roaring success, but only because our Street Rangers themselves launched themselves into it with enthusiasm and commitment that impressed us all deeply. We are, first and foremost, very grateful they all took a chance on us and committed so much time and energy and love to the project. Stepping back, we think there is something unique and special about a well thought-through, highly localized support program for activating local change-makers, and will continue to work on ways to improve the program and perhaps consider it at larger scales. We've been out and about in San Francisco and Oakland today, sharing our National Street Service Listening Post with the community. The NSS Listening Post provided an opportunity to anyone walking by 16th and Van Ness in San Francisco, or 50th and Telegraph in Oakland, to step out of the flow, rest awhile and listen to what the street had to say. We also installed beautiful signage (by extraordinarily talented designer Liz at theysaur.us) at 16th and Van Ness in San Francisco, and 50th and Telegraph in Oakland, with phone numbers anyone can call if they want to hear the stories for themselves. Perhaps most importantly, after each story has played, there's an opportunity to leave one's own story of the street. Call 415-212-4933 to hear Paula tell her story of the inimitable Chile Lindo and the empanada-based joy she brings to 16th Street. Call 415-212-4986 to hear Coral talk about the struggles and alienation of people living on the street. Call 415-212-4352 to hear Keys, sometime-fireman on Telegraph, talk about Oakland streets. National Street Service stories produced by Andrew Stelzer (Paula, Coral, and Elizabeth) Ali Budner (Julie), and Ike Sriskandarajah (Keys). #Streetvalues - The Real Cost of a Parking Spot - what else could it buy? For what one metered space costs the City of San Francisco in maintenance, 291 people could ride Muni. What does the City of San Francisco spend each year to maintain an on-street parking spot? The City of San Francisco spent around $30 million on parking enforcement in 2010-2011. In the absence of empirical data for the split between enforcement of paid and unpaid spots, we making the generous and simplifying assumption that the enforcement budget is 50% dedicated to paid spots even though these are fewer in number, because of the revenue incentive associated with enforcing their use. In this estimate, then, the enforcement budget expended towards on-street parking: $15 million. The City Controller’s office calculated annual expenditures on street maintenance as follows, for a total of $128.4 million annually. Given that the total number of on-street, metered parking spaces in San Francisco is 26,750 (2), and a parking space size of around 144 square feet, we assume a length of around 14 feet. 14 feet is ~0.0026 of a mile. On-street metered parking spaces as a fraction of total public road miles: ( 0.0026 x 26,750 spaces ) / 875 miles = 0.079 or 7% of San Francisco’s roadway miles are on-street metered parking. However, parking spaces typically only make up at most ½ of the roadway space for maintenance purposes, so we discount that number to 3.5%. Total annual maintenance costs of on-street metered parking per year in San Francisco = 3.5% * $128.4 M = $4.49M. Including the cost of enforcement, at $15M / year, the total costs of on-street metered parking come to $19.49M. Per metered parking space, this amounts to $19.49M / 26,750 = $729 / space / year. What about an on-street unmetered spot? We assume that the costs of maintaining an unmetered spot are essentially the same as those for a metered spot: $4.49M / 26,750 = $167.85 per year. We assume that 50% of enforcement costs are expended on those spots: $15M / 248,700 = $60.31 per unmetered spot per year in enforcement costs. The per spot maintenance cost of a parking spot in SF we assume as $167.85 per space per year. So the total cost per unmetered parking space: $60.31+167.85 = $228.16 / space / year. What does these amounts buy? Car-share time: Zipcar publishes its San Francisco rates at $7/hour (5), assuming you’re already a member. On-street metered: 104 hours of car-sharing time. On-street unmetered: 32.5 hours of car-sharing time. On-street metered: 81 day passes or 8 annual memberships. On-street unmetered: 28 day passes or 2 annual memberships.